Secretary of State Mike Pompeo arrived in Saudi Arabia early Tuesday to meet with Saudi King Salman over the disappearance and alleged murder of writer Jamal Khashoggi. President Donald Trump sent Pompeo to the kingdom where he will also meet and dine with Crown Prince Mohammed bin Salman, the country's putative leader. 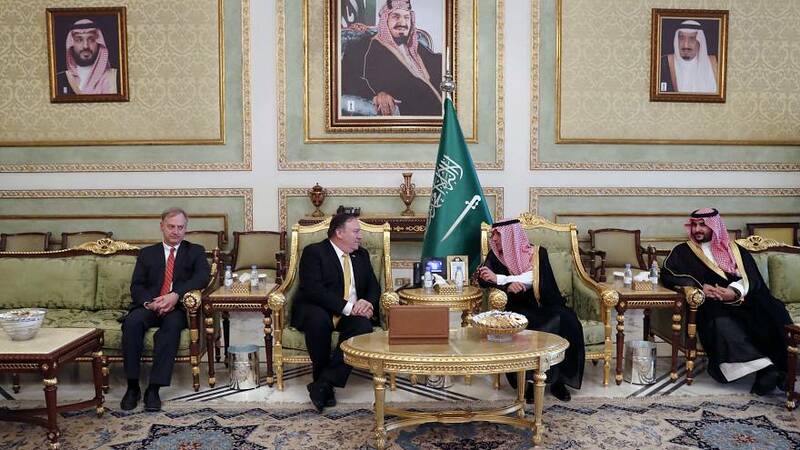 As the secretary of state participated in an elaborate welcoming tea ceremony in Riyadh, reports swirled that Saudi Arabia's government is discussing a plan to admit that Khashoggi was killed after entering the Saudi consulate in Istanbul on Oct. 2. The Saudis are putting together an explanation that would absolve bin Salman of responsibility by giving him plausible deniability to say he didn't order the killing and didn't know about it, two individuals with knowledge of the situation told NBC News on Monday. 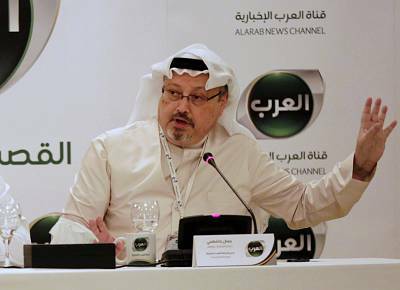 One of those two individuals said he was told by those close to the Saudi leadership that the kingdom will claim that rogue operatives killed Khashoggi during an interrogation or a rendition attempt that went horribly awry. A third individual said the U.S. government still doesn't know precisely what explanation the Saudis plan to give, but that the Saudis intend to admit "culpability." The possibility of a Saudi shift in explanation is expected to be discussed directly with Pompeo. On Sunday, Trump spoke by phone with King Salman, who is the crown prince's father. The president tweeted Monday that the king had denied any knowledge of the whereabouts of Khashoggi. Moments later, he told reporters that it had sounded from the conversation with the king "like maybe these could have been rogue killers — who knows?" Meanwhile, in Istanbul Turkish investigators searched the consulate building. A longtime regime insider who last year left Saudi Arabia and began writing pieces for The Washington Post that were critical of the powerful crown prince, Khashoggi vanished earlier this month after entering the Saudi consulate in Istanbul. This created a major diplomatic crisis for the kingdom, with mounting evidence that the Saudis were involved fueling a growing outcry from foreign governments, U.S. lawmakers and the Trump administration. Turkish officials say they fear Khashoggi was killed and dismembered inside the consulate. But Saudi officials have called the allegations "baseless," and responded furiously to what it termed "threats" of economic or political pressure after Trump warned of "severe punishment" over the weekend. Khashoggi's family issued a statement on Monday calling for the establishment of an "independent and impartial commission to inquire into the circumstances of his death." As the scandal continues to unfold, a slew of businesses leaders and media companiesannounced they were pulling out of the Future Investment Initiative economic conference set for next week in Riyadh. Treasury Secretary Steven Mnuchin said last week that he still planned to attend to conference. But Trump said Monday that the final decision would be made by Friday. "We haven't made a decision about going yet," he told reporters.